Over the years many of us have joined WPA and worked to realize its preservation mission. WPA has passed that work from generation to generation, hoping that through our vigilance Wonalancet will continue to be the historic gateway to the White Mountain National Forest that the public has always enjoyed. We've accomplished a lot but there are challenges ahead. Urban sprawl, while still a ways off, is affecting us here. Many more people are hiking the trails and overflowing the parking areas. Traffic is increasing as more homesteads are being built. And while we must welcome these changes, we should consider the impact they have on our preservation mission. But what can we do about it? How would we incorporate the inevitability of change into a strategic plan that serves everyone and builds on our preservation mission? These questions have become an increasingly important topic of conversation at Board meetings in recent years, and ultimately led the board to a concerted effort to develop a vision statement for Wonalancet. What would we want Wonalancet to be like in 50 or 100 years? Answering this Question became our quest. Could a community-wide vision statement be crafted that had the support of all the stakeholders living in the Wonalancet area, and might that vision eventually render an action plan that we all could support? The Board of Directors has created draft vision statements for each theme. Please read the statements below, and send along your thoughts via a brief survey. With your help we will continue to evolve this vision during the coming year. Interesting ideas are already coming in. A physically bucolic, yet wild, landscape rich with biological diversity, has been preserved through the extensive conservation of forested lands and open fields, and the limited and appropriate development that has ensued. Historic open fields remain open and productive, and support a diversity of crops and animals, both for food and pollinators. Rotational grazing has gradually improved soil tilth and fertility. Forested uplands bordering the WMNF have been permanently conserved, creating a wild buffer for both the federal wilderness and non-wilderness areas of the Forest. Water quality in the Wonalancet River has been protected by additional conservation buffers along both sides of the River. A multi-generational resident population is strongly connected to Wonalancet for the long term. It takes an active interest in all matters pertaining to Wonalancet and is vigilant that human activities do not diminish the natural assets of the area. Community members volunteer in myriad ways to ensure that Wonalancet remains a place for the restoration of the spirit and low-impact recreation. Writers and musicians add their voices to the music of brook and wind. A village center houses an attractive, well-provisioned, cooperatively-managed farm market/store containing organic produce and fruit from the farm and other local farmers, plus locally-raised meats, dairy, essential staples, a café, and coffee bar. The farm provides a CSA, provides a venue for events like concerts, talks, workshops, wine and microbrew tastings, film screenings, etc. Wonalancet residents support economic enterprises that are appropriate to, and invigorate, Wonalancet. This is based in the recognition that viable livelihoods are essential to the sustainability of the village. Wonalancet has taken steps to become more energy independent, food self-sufficient, and vigorous by re-imagining what is possible and necessary in a world of declining natural resources, fossil fuels, and reduced reliance on centralized systems (such as industrial food) which are vulnerable to collapse as the global climate continues to warm. Let’s join together and embrace the future proactively! Our "Little Library" has been servicing the neighborhood for almost a year now. If you haven't used it you'll find it near the mailboxes at the entrance to Ferncroft Road. Most books may be returned - or not - at the discretion of the borrower. Enjoy! Also, Coming soon to the library is a bulletin board where folks may leave messages or browse local activities and events. SUNDAY AUGUST 12, 5:30 FOR POTLUCK, 7:00 FOR PRESENTATION. This is the one time each year we gather with our members and neighbors. It's a chance for the community to discuss and refine our policies and goals as we broaden our efforts to realize our mission. The potluck is always fun and a chance to meet new neighbors and board members. This year our special presentation will examine Regional Land Conservation Prioritization based on The Nature Conservancy’s Science initiatives. Scientists are bringing more focused definition to our climate and preservation challenges with very interesting high-tech "big data mapping". This fascinating work explores and explains new approaches to Regional land management thinking and practice. The map is an example of the innovative data mapping as it affects us here in the Wonalancet area. Come to the Annual meeting and learn more about it. 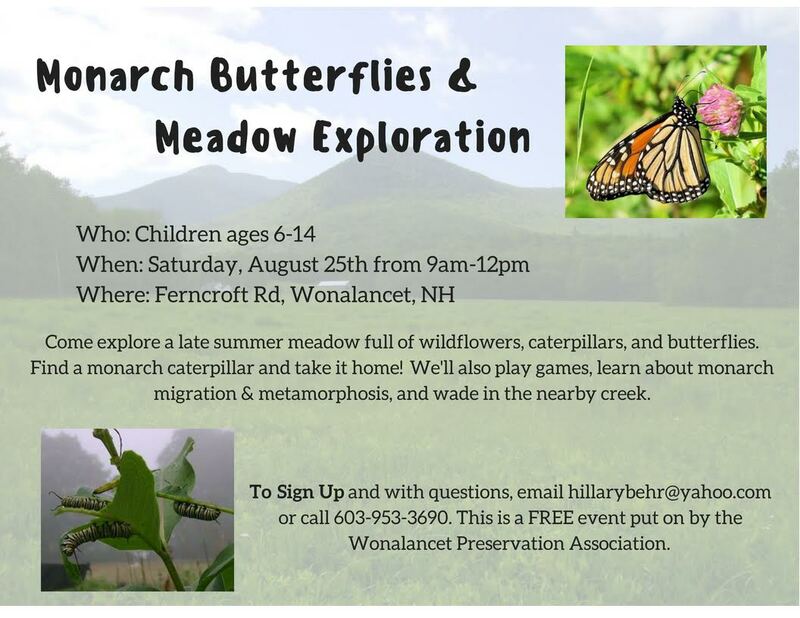 Last years topic on invasive species, given by Doug Cygan, Invasive Species Coordinator, New Hampshire Department of Agriculture, helped us to identify those species found here in Wonalancet and will help us to fashion a sensible strategy to control them. More to come on this as WPA prepares to disseminate this information to the community and establish an action plan. We continually encourage and support permanent protection, but doing so means constantly replenishing our Wonalancet Fund. Please consider a gift to the Wonalancet Preservation Fund. We have depleted it considerably in the recent past assisting with major conservation transactions in Wonalancet. This fund is essential for most everything WPA can accomplish in pursuit of our preservation mission. WPA is a 501(c)(3) organization, so all donations and dues are tax deductible to the full extent permitted by the IRS. For the third year we are promoting educational activities for youngsters in the Tamworth schools.This effort to develop conservation-minded values in tomorrows adults is championed by Helen Steele, a teacher and School Committee member. "I am committed to learning through doing. The fourth grade and Mr. Krug and I have taken four hikes into the woods and on the river to investigate the history, uses, and reasons for trails. Learning cubed." 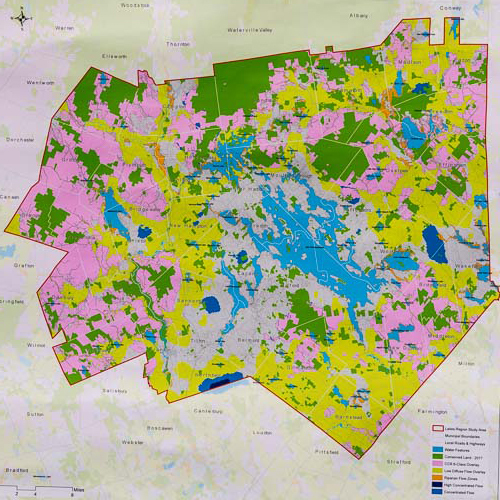 Three years ago, thanks to the work of David White and Ms. Olivia Bartlett, we updated our map to show the protected properties in the central Wonalancet area. The map also brings focus to some of the preservation challenges we face in the immediate future. The areas in Green stripes have been protected more recently. In 2015 WPA initiated a matching fund drive within our community to help raise the money to purchase the 57 acre Ainsworth parcel so central to downtown Wonalancet. It had been owned and carefully stewarded by successive generations of the Ainsworth family since 1943, when Walden Lee Ainsworth and Gladys Ainsworth Salisbury acquired the parcel (along with other land and Wonalancet Farm) from Arthur Walden. The 57-acre Albany tract had been identified as one of a number of conservation priorities by the WPA, which commissioned a professional Opinion of Value to establish a basis for Fair Market Value. The Ainsworth and Riggs families had for several years previously been looking into sale of the property to the WMNF or to another conservation organization. Lakes Region Conservation Trust was asked to become involved, to lend its expertise to the negotiation, and to craft the final agreement. Funds for the acquisition were raised largely from within the local community by a few of your neighbors and other friends of Wonalancet. The Wonalancet Preservation Association contributed $10,000 and provided an additional $10,000 matching grant to help leverage private donations. 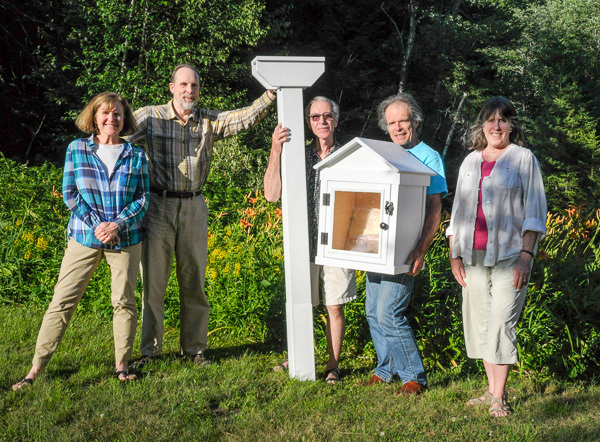 The Board of the WPA thanks all of you who made the Ainsworth/Riggs purchase possible! LRCT has a strong interest in conservation within the Wonalancet area, and has since completed protection of two other parcels, belonging to Nancy Stearns and Ruth Moscovitch / Vinton Thompson, respectively. Both of these are donated conservation easements, and the Moscovitch/Thompson project also protects public access to the WODC's Old Mast Road, Kelley, and Wonalancet Range Trails. Total acreage permanently protected by these three projects is just under 150 acres. The honey bees and other pollinators are trying to make their living in Wonalancet. How can we work with nature to minimize life-threatening stresses to all our wild pollinators? The honey bees and other pollinators are trying to make their living in Wonalancet. HHow can we work with nature, including the amazing honey bee colonies, to minimize life-threatening stresses, not just on the happy honeybee hives of Wonalancet, but on all our wild pollinators? 1.) I suggest that, whenever possible, the mowing of our fields be staggered so as not to wipe all foraging out at once. 2.) Most flowers give forth nectar in the morning and pollen in the late morning to early afternoon. 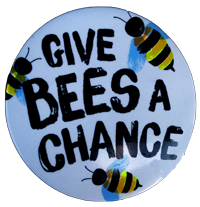 Bees know this and respond accordingly. For that reason, mowing late in the day is the best strategy to avoid mowing the bees along with the grass. 3.) Farmers have to make hay when they can, of course. But if people who are not harvesting hay were to wait until after the flowers have had their chance to bloom and go to seed, both the bees and the farmers would benefit. In Wonalancet this means mowing is ideally postponed until early September. 4.) When the haying can’t be delayed, wildflowers of value might be left in patches to grow until they go to seed. Dividing large fields into a two or more sections and mowing them alternately would offer a better chance for recouping needed food stores. We are so privileged to live among the many beauties of nature that make up Wonalancet. Honey bee colonies are just one pollinator that our wild fields here continue to sustain. Let them hold our attention for a little while this season as we gain insight into how humans continue to dramatically impact our natural world. Introduced to North America by European settlers at Jamestown, Virginia, in the 1600s, the honey bee is today a witness to, and often a casualty of, all the extreme changes we’ve imposed upon our extraordinarily beautiful natural landscape in the centuries that have passed. In Wonalancet, the honey bee colonies enjoying the sun and fields on Ferncroft Road and Red Path are lucky indeed. Having changed very little in evolution since the earliest fossil finds in 80-million-year-old amber, this self-sustaining insect continues to nourish mankind as well as teach us, if we are willing, about how to get it right. They take four simple things out of nature: nectar, pollen, water, and plant resins, and from them build entire working civilizations with substances produced simply with the glands of their little furry bodies. From ingesting nectar they manufacture honey for use by the entire colony, with a little to spare for the beekeeper. They create baby formula for their young, a mix of honey and pollen, watered down just enough to make it palatable. From resin they make and apply antibacterial proplis on the walls of their hives, filling up cracks to protect the entire super-organism of the colony from seasonal drafts and harsh winter winds. 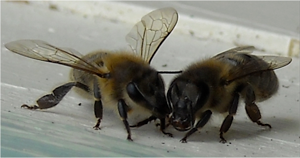 Unlike the native solitary bees of North America, they overwinter as a family, huddling in the cold, sharing their winter stores of honey evenly to the last bee. Honey bees excrete a creamy white pure food called Royal Jelly that has the power to transform an egg into a queen. Wax from their bellies comes forth to mold storage facilities for their food, nurseries for their young, and even a pantry for drying processed nectar into liquid gold. Of the three types of bee in a colony, the worker is aptly named. She lives a brief six weeks, growing up learning all the varied tasks required to maintain the colony in good health. When newly emerged, they are nurse bees caring for the eggs and larvae and then they assist baby bees to learn their way in the dark. They can’t see, fly, or sting when young. As they grow into juveniles, they take on different responsibilities, like making comb and receiving nectar from foragers. Only when old enough to join flight practice do they begin to venture from the hive. They learn how to guard, how to gather nectar and pollen, and—how to dance! Yes, dance! Honey bees are not opportunistic foragers for beautiful flowers. They learn where to go from their older sisters. The dance is a very precise navigational tool. It tells them how far, how much energy to expect to expend on the journey, taking into account wind velocity and obstacles, and what direction to fly. The dancer gives out samples of the nectar found, because efficiency is paramount to the survival of a honey bee colony. They can tell which nectars are sweetest and choose the closest to the hive. In the short two weeks they have left in life to gather for the colony, they may spend it entirely foraging on one patch and one kind of flower. Thousands of them are needed during the seasonal nectar flows because a colony in Wonalancet will need an extra 60 to 120 pounds of honey stored on the hive to get through our unpredictable winters. Early in 2014 Olivia Bartlett, a GIS mapping specialist and instructor at Plymouth State University, using data supplied by David White, began creating a new map of Wonalancet. Brian Gagnon, who works for the Squam Lakes Association, had first made contact with Olivia on our behalf. She started by giving one of her graduate students the assignment of beginning to digitize property information from tax maps in Tamworth, Albany, and Sandwich. Our intention was to gain greater clarity about the relationships of private properties to each other, to the WMNF, and to already conserved parcels. Certain inaccuracies in our representation of properties exist because tax map information, from which we derived our data, is not perfectly accurate. 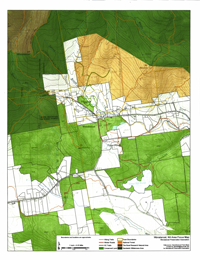 Because Wonalancet lies at the intersection of four towns – Waterville Valley, Albany, Sandwich and Tamworth - it has been difficult to visualize where individual property ownerships lie, and to what extent they fall in more than one town. The map has been created by digitizing tax maps from the four towns, bringing them into the same scale, and then superimposing them onto a base topographic layer. A careful inspection will reveal certain matters of scale that were not resolved. When the road locations taken from the tax maps were overlaid with the road locations on the topo layer, the town lines did not line up exactly. A decision was made, in the interest of clarity, to live with the misalignment of the town lines. Trail locations were taken from the WODC map. This resulted in one of the larger discrepancies, as in many cases the trail locations shown on the topo base layer are quite different from those shown on the WODC map. Both are visible on the new map. It's likely that Mike Bromberg’s use of GPS to locate all the trails on the WODC map makes his information more reliable. In a few instances, there may also be discrepancies due to trail relocations since the original trails were made.